Zadar Airport is mainly located in the Zemunik Donji region about 8 kilometers from the Zadar railway station. It has its IATA code as ZAD as well as its ICAO code as LDZD. It is the main airport that serves the Zadar region in Croatia. The airport also serves as a hub for the Lufthansa's flight school as well as the Croatian Air Force. Zadar airport is famous in the whole world as it has a taxiway which crosses a public road. The Airport type is a Public one which is being operated by Zadar Airport Ltd. It is at an elevation of about 88 meters from the main sea level. We have our car rental facility available at the Zadar airport for our all types of passengers. Zadar is a main city in Croatia region which is mainly on the Adriatic Sea. It is the centre of Zadar County as well as the wider northern Dalmatian region. Zadar is a well known historical center of Dalmatia as well as the seat of the Roman Catholic Archdiocese of Zadar. The St. Donatus church that dates back to 9th century is the famous attraction to visit in Zadar. The Kopnena vrata also called as the Landward Gate lies exactly with the Lion of Saint Mark which is a famous symbol of the Republic of Venice is also a famous attraction that can be visited through our car rental service at the Zadar Airport. 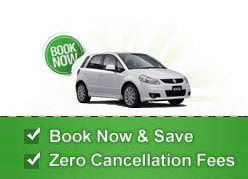 Get the best car rental deals at Zadar Airport for exclusive prices through us. Call us now and learn more.